Nestled between serene lakes and surrounded by the Appalachian Trail, our first-class facility awaits your group in the stunning Catoctin Mountains of Pennsylvania. We are conveniently located close to Washington DC, Baltimore, Philadelphia, New York, Virginia and three major airports (Baltimore Washington International, Reagan National and Dulles International). The opportunities for a fabulous event are limitless. From exceptional food to comfortable lodging and outdoor team-building activities to audio visual presentations, we have you covered so you feel, look and sound great! 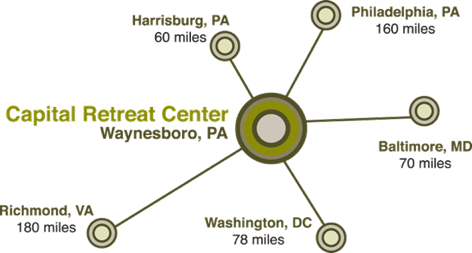 Our Capital Retreat Center located in the Mid Atlantic Region s a first-class, full-service hospitality campus. Having provided retreat services since 1987, we are experts in experiential learning, group dynamics, leadership training and youth education. Our brand-new Conference Center, Nesiya Lodge, opened in 2012, and along with our other facilities on-site, all built between 2002 and 2007, amply support our guests. We believe that retreating can achieve maximum impact if itineraries are meticulously planned and seemingly effortless in execution. Itinerary options should refresh, renew and enhance both the participating group and individuals. While buildings are vitally important to success – we will always be an environment that challenges, nurtures and cares for retreat participants of all ages, whatever time of year they join us to experience a retreat program. Capital Retreat Center is owned and operated as an independent 501(C)3, non-profit organization. We are located in Waynesboro, Pennsylvania and our Administrative/Business office is located in Rockville, Maryland. The agency is a beneficiary of the Jewish Federation of Greater Washington, an American Camp Association (ACA) accredited camp and a member of the JCC Association. In 2002, the Washington, D.C. and Baltimore Jewish communities joined together to undertake a massive redevelopment of the facility that will ensure we remain a first class camp and retreat facility for many years to come. Come visit us and you will see that our facility is second to none in the Mid-Atlantic! To schedule a tour, please contact Richard Weinstock, Director of Sales, richard@capitalretreat.org or call direct 240-283-6162 during weekday business hours, Monday-Friday, 9am-5pm.